Hello there! 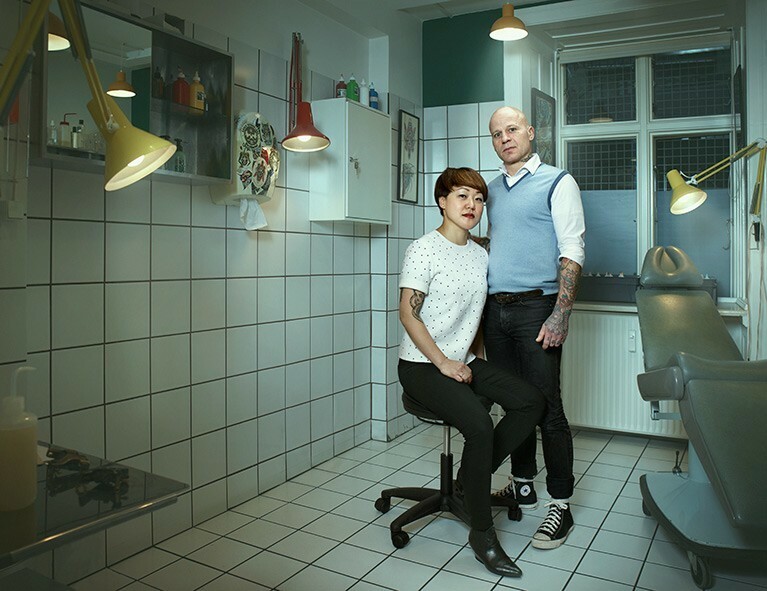 We are Franz Jäger and Gitte Klebajn, and we are running Le Fix Tattoo at Nørrebro in Copenhagen. We offer professional custom tattooing in a clean and friendly environment. Le Fix Tattoo was opened by tattoo artist Franz Jäger back in 2006, and has since day one been located at Guldbergsgade in the heart of Nørrebro. The shop quickly became one of Copenhagen’s most respected and trusted tattoo shops, known for its high quality custom tattoos and artworks. Franz, who has a background from the Danish graffiti scene, has been tattooing for the last 16 years and is one of Denmark’s most renowned tattoo artists. Besides being the owner of Le Fix Tattoo, he plays an active role in Dansk Tatovør Laug (the only official tattoo association in Denmark), promoting health and safety issues in the tattoo industry. Gitte has a degree in graphic design and is furthermore educated in visual arts, which is reflected in her exceptional eye for details when she is tattooing. She joined the shop in 2010, where she first started as Franz’s trainee. Both Franz and Gitte are characterised by their versatile tattooing style, professionalism and knowledge on the subject. Visit our gallery of tattoos and artwork made by Franz Jäger and Gitte Klebajn here.